For one, it has a beautiful presentation. Folk will either think it's too pretty to eat, but trust me when I say that it won't take long before someone dives right in. Secondly, anything made with buttery phyllo dough is going to be good. For this 'Serpent's Coil' I filled it with a mixture of 2 cheeses and garlic. However, you can make your favorite filling and prepare it in phyllo dough as the recipe states too. Although I served this as an appetizer, you can surely prepare this as a main entree when accompanied by a salad and other side dishes. To serve, I cut it like a pie and served it in wedges as seen below. Combine all the filling ingredients in a large bowl until completely incorporated. Transfer the mixture into a gallon sized storage bag or pastry bag. Chill in the refrigerator. In the meantime, place Grease a 10-inch pie plate with butter or non stick oil spray. Line a clean surface with a sheet of non stick parchment and take out your filo pastry. Cover the phyllo dough with a damp tea towel to prevent it from drying out. Remove one sheet of pastry from under the tea towel and brush with butter. Top with another sheet of phyllo dough and repeat until you have a stack of four buttered phyllo sheets on top of each other. ilo dries out very quickly so have a damp tea towel on top of it to prevent it from drying. 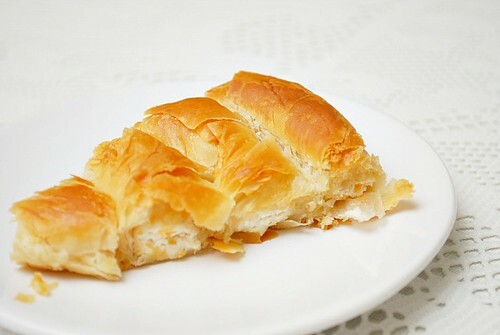 Take out one sheet and recover pastry. Brush with butter and then place another on top of this and butter and repeat until you have four buttered sheets on top of each other. Remove the filling from the refrigerator. If using a storage bag, snip one bottom corner of the bag to create an opening large enough for the filling to be piped out of. 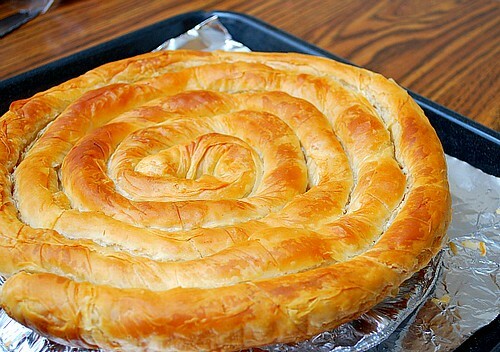 Pipe or place a line of filling the length of the phyllo dough about 1 inch from the edge. Flip the phyllo edge over the line of filling and begin rolling the phyllo dough to the opposite edge. Try to roll the dough into a nice, tight roll. Cover each completed roll with a damp tea towel and repeat with the remaining sheets of phyllo dough and filling. Brush the top of the coil with melted butter and using a wide spatula, transfer the coil onto a parchment lined baking sheet. Bake in the preheated oven for 30-35 minutes until the top has lightly browned. Remove from oven and serve hot. Slice in wedges like a pie to serve. 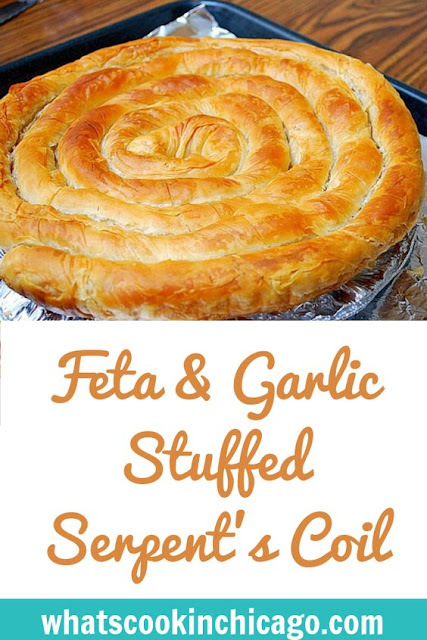 This sounds simple scrumptious and it looks very cool too! great name and great looking recipe. In the past, My fingers were too fat to work with filo dough, but i may just give it a shot again. I love dramatic presentations like this. 2012 is a good year for business! Start a food cart business for as low as 26,888 Pesos only! Buy 1 Take 1 Promo until Jan. 7, 2012!